Police investigators have interviewed an unnamed person who provided information and recordings in connection with the businesses of Benjamin Netanyahu's cousin, Nathan Milikowsky, Ynet has learned, The information relates to regarding the payment made by Netanyahu for shares in Milikowsky's company, which were purchased in 2007 for $600,000 and sold for over $4 million in 2010. According to the information, an associate of the Milikowsky family claims that the purchase payment was in fact never made, and the transaction was meant to facilitate a transfer of money from Milikowsky to the prime minister that was never divulged to authorities. 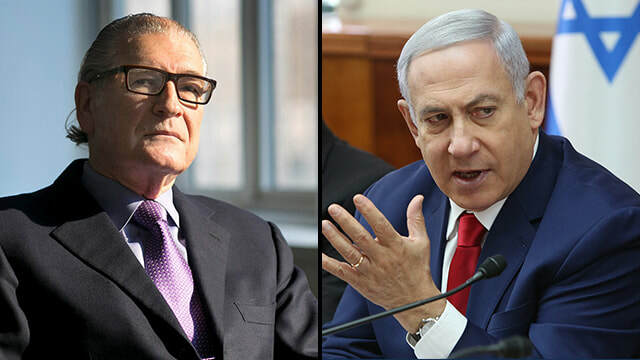 Netanyahu's business relations with his cousin came to light when the prime minister requested financial assistance from Milikowsky to pay for his legal fees. This request was turned down by the State Comptroller Yosef Shapira. The state comptroller's office suspects laws may have been broken and that Netanyahu did not provide an accurate account of his finances. In run-up to the 2019 election campaign, no further steps were taken, but it is believed Attorney General Avichai Mandelblitt will instruct police to begin preliminary inquiries into these suspicions. In response to Ynet questioning, the Prime Minister's Office released the following statement: "The prime minister paid for the stock. He was a passive investor in the company with a tiny share interest and no involvement in the company's business, its administration or in any other way. All relevant transactions were reported to the proper authorities in accordance with the law." A subsequent comment released on behalf of the prime minister states: "The prime minister's actions were in complete compliance with the law. The police department has denied it has opened an investigation into the matter. It seems elements in the press have yet to accept the election results. Over are the days when fake news items were published simply to prompt needless investigations of Prime Minister Netanyahu." A police spokesperson released the following statement: "The Israel Police is not responsible for information that has not been officially released. Thought we do not normally comment on investigations or lack thereof, in light of the sensitivity of these reports we would like to make clear that the police has launched no investigation or inquiry into this matter, and the testimony of an unnamed person who chose to come forward does not point to any investigation being conducted." The Justice Ministry spokesperson said: "We do not comment on steps taken by investigative bodies including information they may have received. In the interest of clarifying any outstanding questions, there has been no decision taken yet regarding Netanyahu's stock issue, therefore, no investigation or inquiry has been launched." governing coalition has ever invited the Arabs to be part of the government. The result is clear, and rather predictable. The right wing under the leadership of Benjamin Netanyahu has a clear majority. SHIR HEVER: I have to disagree on this point. I think that if we look at it from the perspective of Netanyahu formulating his strategy on how he wants to proceed as the prime minister, the timing of the election was perfectly orchestrated by him. He decided exactly which parties are going to run, and he was able to control the media coverage. And the result is not surprising at all, because I think that’s exactly what he wanted. The election leaves him with two options. He can either form a coalition with the far-right parties, the openly racist parties that are saying that their condition to joining his coalition is to pass legislation that will make it impossible to indict an acting prime minister. In other words, to get him off the hook on all his corruption charges. LIA TARACHANSKY: Moshe Feiglin is a very known Israeli extreme right politician. He used to be in the ruling Likud party. He now has his own new party called Zehut, which means identity. He tried to throw in a last-minute popular issue into these elections by claiming that he was pro legalization of marijuana. But that is a very last-minute move. What he is most known for are the books that he has written and the positions that he has taken. The things that he has talked about endlessly is that he supports ethnic cleansing of Palestinians from Israel. He supports basically the replacement of the Haram Ash-Sharif, the Golden Dome mosques on the Temple Mount, with a third temple. He is an extreme alt-right, far-right, openly racist politician, and he didn’t make it into this Parliament. MARC STEINER: Well, that’s a–you’re making me now, Lia, switch what I was going to ask next, which had to do with what’s going to happen to the West Bank, and kind of seizing all the land in the West Bank under this new Netanyahu government, which I want to come to next. But let me just explore something out of what you just said for a moment. Does this election, given the strength of what you call the broad left, the broadest definition of left, and looking at how many votes they got, the fact that that the two coalitions of our parties, and the left parties that are further left than that also retain the 10 seats in the parliament, in the Knesset, is there any hope in the larger sense that a struggle inside of Israel for a future that doesn’t remain with Israel as an occupying territory? Israel is expanding by taking all of historic Palestine under their rule completely. I mean, is there now something being set up politically where a new debate can happen, where a new push can happen, that doesn’t allow that to happen? Does this election say anything about that? And then the vast majority of Palestinians that live in the West Bank would then be living in walled ghettos, forever connected with a system of roads that keeps them connected, but essentially makes their life there nearly impossible. And then Israel can claim sovereignty over the West Bank, settling forever this 50-year-old question of how you can conquer a land without giving any rights to its people. You can conquer land and keep the people that live on that land in a limbo, which is what the Israeli occupation of the West Bank, Gaza, Golan Heights, and East Jerusalem has been. However, from the get-go, the idea with Gaza was that it is just too many people, and there is not enough assets in this territory on the coast, in the Gaza Strip, to keep it. There’s no reason to give those people any access to Israel, and to claim sovereignty over that land. And so the question has always been how do we convince the Egyptians to take that land? And now what we’ve seen with General Sisi’s government is that in fact the Egyptians are quite warm to the idea, and have been hinting that they are willing to take Gaza. Which means that with East Jerusalem being more or less completely annexed in the reality on the ground and in the words of the Americans; the Golan Heights, almost the same situation; Israel claiming sovereignty suddenly over the West Bank is not something that I think is going to lead to profound changes on the ground, because of course Israel today is the only sovereign power that dictates the lives of all of the Palestinians. Now, every election, and this was no exception, on Election Day there is a closure on all Palestinian cities and villages in the West Bank. Gaza is closure every day. But in the West Bank they have a special closure for the election. So while Israelis can go and vote, Palestinians are not able to move. And one Israeli professors that I want to quote here said on these conditions the only moral choice for Jewish Israelis to use the privilege that they have to participate in the political process is to vote for the non-Jewish parties, to vote for Arab parties. That’s the only thing they can do morally under these conditions. And there was an interesting poll by the organization [local call] where they asked people, would you consider voting for–they asked Jewish people, will you consider voting for Arab parties? And the answer was almost zero. Less than 10 percent. And when they asked Arabs, will you consider voting for a Jewish party if its ideology is close to yours? The answer was over 70 percent yes. MARC STEINER: So we’re talking to Lia Tarachansky and Shir Hever on The Real News, and I’m Marc Steiner. We’re going to end this part of our conversation now, but come back and watch the second part of this conversation as we explore in more depth what this election means, the role of Avigdor Lieberman, the right-wing Russian politician who may be becoming the kingmaker, and what this portends for the future. So I hope you’re enjoying this conversation. I know I am. We’ll be back with our two guests.